It's considered a Japanese national treasure, but the colors on an 8th century statue of the Buddhist deity Shukongojin have all but faded. Now, using computer graphics technology, a joint team from Tokyo has brought its vivid colors back to life. The 68-inch (173 cm) tall statue is only displayed to the public once a year at Nara's Todaiji temple. Normally, it's kept in a Buddhist altar called "zushi" at the temple's Hoddedo (Sangatsudo) Hall — another Japanese national treasure. The computer restoration was conducted by a joint research team from the Tokyo University of the Arts and Tokyo University of Science. As a result of two years of research, the team used computer graphics technology to re-create the colors of the rich-colored patterns of the statue from the Tenpyo Period (729-749), based on pigments that remained on its surface. 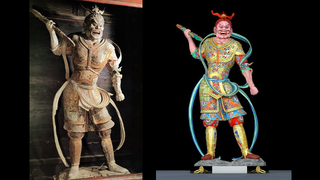 The restored colors also show peacock feathers used to encircle the "hidden" statue, which wields a "vajra" (thunderbolt) in his right hand.